Have you ever noticed anything missing from our blog? Something that has never ever been featured, never even mentioned in a passing whisper? If you’re not looking for it, you’ll never find it. We’ve ignored them so well, found their substitutes so good that they never really needed to appear before. They come in all shapes and sizes, all types and textures. Guessed yet? I’ll give you a clue – there are pictures of them everywhere through this post. Yep, you got it – we’re talking about mushrooms of course. I won’t bore you as to why I have a personal grudge against the slimy little bastards, but I really do not like them. I am however aware that I’m in the minority here, and if you’ve searched for this recipe then there’s a very good chance you like mushrooms. And if that is indeed the case, you’re in the right place. Sometimes a recipe comes along that’s just too good to turn down. 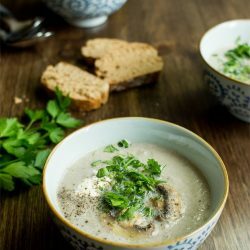 This mushroom soup is the one used at the Muse Cafe in the UK (thanks for sharing the recipe Clare and Jan! ), and as a best-seller it has thousands of happy customers willing to attest to just how tasty this soup is. Just to be sure, Hauke made it for a dinner party – it went down a storm. It’s really quite the soup. 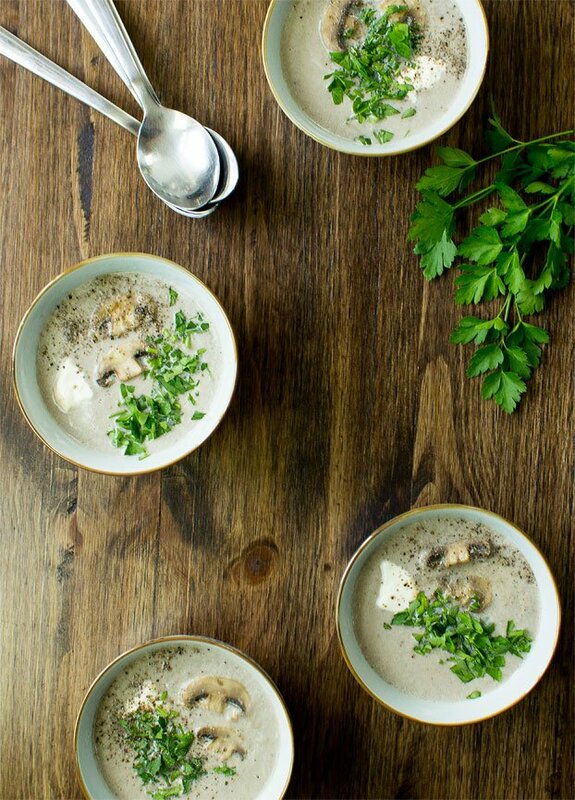 If you’ve been looking for a vegetarian mushroom soup, then look no further. It might not be for me, but I do enjoy a good bit of investigation. I remember reading an article a while back on the myths and various pros and cons of washing mushrooms, but I hadn’t realised there was quite such a war going on. Let’s take a look at the mushroom washing fears and realities. 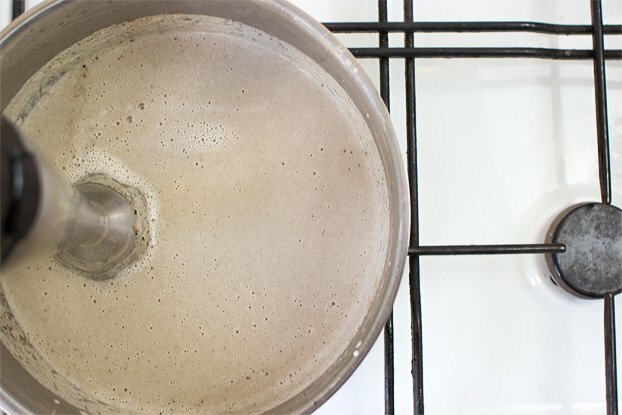 Fear: Washed mushrooms will take on extra water. They will lose texture and take longer to cook. Reality: Mushrooms are already 90% water and any extra is negligible. In fact, several tests have shown the water absorption is 2% (or less) and it has no impact on cooking time or texture. (Plus, in a mushroom soup you wouldn’t have to worry about too much water anyway. Fear: Washed mushrooms won’t take on oil properly, and won’t crisp up as nicely. Reality: True – but only if they’re sopping wet. 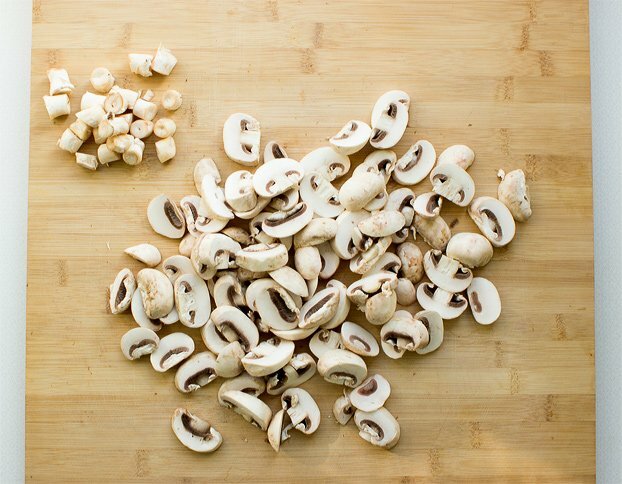 Give your washed mushrooms a quick pat try (or use a salad spinner) and they’ll be more than fine. A tiny bit of water will evaporate in heat at an exceedingly quick rate. Fear: Unwashed mushrooms may harbour all kinds of unwanted baddies. Reality: True – Hand picked mushrooms could literally have anything clinging to them, and even farmed mushrooms could have something unpleasant on them. Why would you want to eat that? Fear: Washed mushrooms will turn slimy. Reality: True – A washed mushroom that is left uncooked will not be nice. Anyone who has ever left a wet mushroom sitting around can testify to this. So, don’t wash until you’re ready to cook! Fear: Washed mushrooms just don’t taste as good. Reality: False. The people we force-fed noticed no difference, nor did the tester in this review. This forum also has plenty to say on the matter. Definitely wash your ‘shrooms! Using a brush or towel takes an inordinate amount of time and is just not necessary. Instead, use water and a colander, and pat them dry or use a salad spinner. Cook them right away. Fineline: washing is important to get rid of all sorts of nasties and won’t impact on taste or texture. Strictly speaking, this soup is so good it doesn’t need anything extra, but if you like to experiment then parsley, coriander, thyme, rosemary, garlic and ginger all pair well. Dice then fry the onion in a pot on a low heat until it starts to turn clear, roughly 3-5 minutes. In the meantime wash and pat dry the mushrooms (or spin in a salad spinner). Chop the mushrooms and add them to the pot. Let it simmer for about 3 minutes stirring occasionally. Add the broth to the pot. Cook until mushrooms are soft, around 10 minutes. Add cream and take off heat. Stir well. 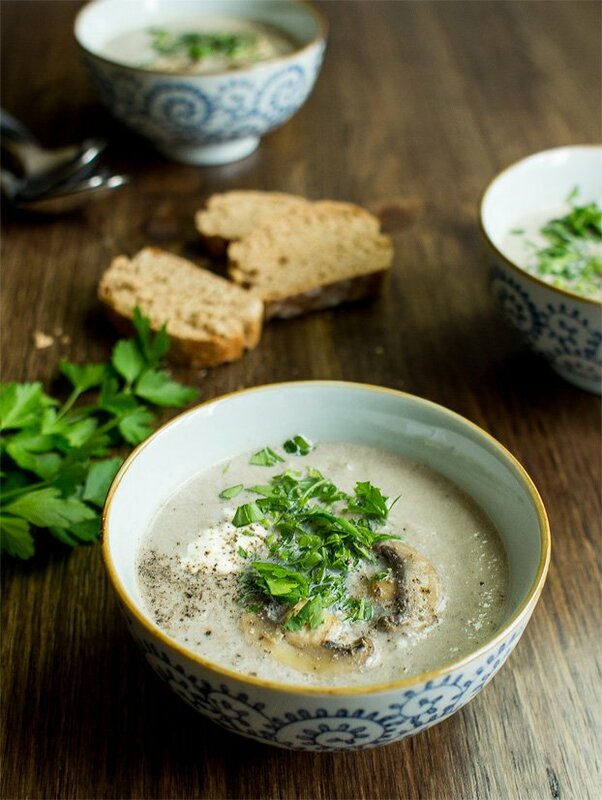 This mushroom soup works great as an appetizer. In that case 2 servings will easily be enough for 4 people. If freezing, don’t add cream until reheating. 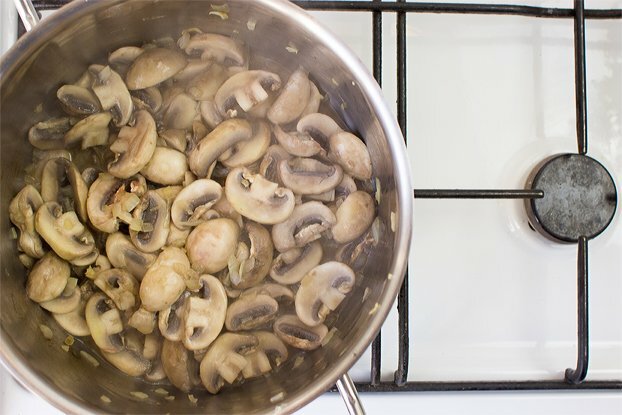 To make a thicker soup add more mushrooms, to make a thinner soup add more stock. 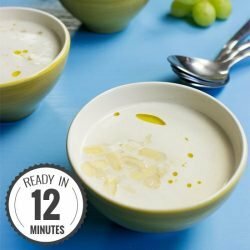 IF YOU LIKED THIS RECIPE: there are many more lovely soups out there! 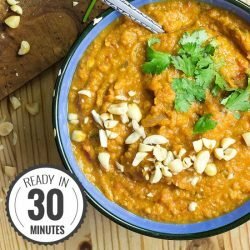 An all time favourite is this African Peanut Soup (check out those crazy reviews!). This Spicy Vegan Black Bean Soup is an absolute beast too. In fact, here’s a whole page of goodies! Good point Bianca! 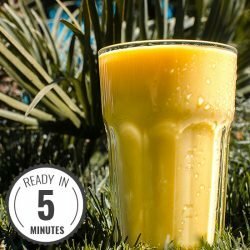 Yes, a quick blend gives it that creamy feeling. Somehow that’s got missed out in our instructions, I will update. Thanks for pointing it out!